More soup! Can you ever have enough soup? Not in my opinion, but I DO know a few people who are less than obsessed with soup. Potato soup has a long history in my life. It starts something like this. Every Christmas Eve at my house, we would have soup. My mom would prepare 4 or 5 kinds of soup, and we would have sandwiches with DELI meat! This was a big deal because in the little country town I grew up in, when I was a kid, we couldn't get meat from a deli. Our grocery stores had butchers, if you wanted shaved ham, well, you had to do it yourself or go to the nearest "city" which was an hours drive away. So all of my older siblings who lived in college towns or a city, would bring back different meats and cheeses for our special Christmas Eve soup and sandwich feast. Anyway, back to the soup part of this whole thing. My mom would make of course, chicken noodle soup because it is MY favorite and I am HER favorite, oyster stew, chili, and potato soup. I don't even want to discuss the oyster stew or the chili because it had beans in it. We all know where I stand on chicken noodle soup so all that is left is the potato soup. Now I am sure she learned to make potato soup maybe from my grandmother, who I never knew. Isn't that sad, I never knew any of my grandparents. I remember talking to my grand mom in Philly once before she passed away. Anyway, I am sure she learned from her mom or an aunt or something. Her potato soup, which most people looooovvvveeed, was basically hot milk, chunks of potato and melted margarine floating on top. I ate it a few times, but mostly had my face full of chicken and noodles so hardly had time or tummy space for hot milk and potatoes. If I recall, it did have onions in it as well. Yea, it did. It had onions. So obviously she made a very soupy, thin variety of potato soup. Oh crap, I think it might have had celery in it too. Regardless, I think I have painted the picture with enough detail. As an adult, I have had so many potato soups. Most involved cheese, or bacon, sour cream, sometimes cubed potatoes sometimes smashed up mutilated potatoes that looked like someone ran them over. I knew I needed to invent my own recipe for potato soup. I wanted plain old fashioned potato soup....but better. I didn't want a ton of veggies, or it is veggie soup. I wanted thicker than water but not as creamy as a true cream soup. The point is, I think I got it. Well, I know I got it. I have made this before, but changed a few things this time and the changes are perfected it for me. So if you are looking for "loaded" potato soup, this isn't it. This is just plain old fashioned potato soup with lipstick on! I did use one canned item. Love it or don't, change it out or don't, but it shouldn't be left out in my opinion. In a large pot add in olive oil, butter, shallots and salt. Stir and let cook for 3 minutes. Add in flour and let cook for another minute, stirring constantly. Next add the stock and potatoes. Cover and let simmer 10-15 minutes depending on the size of the dice on your potatoes. Stir occasionally and then add in half and half, ranch seasoning, mushroom soup, onion and parsley. Stir until it is smooth and simmer UNcovered for another 10-15 minutes. Stir every few minutes so it doesn't stick or burn. It will thicken a bit and become perfect and the smell will drive you crazy! I hope you enjoy this potato soup. It has a great flavor with a tiny hint of dill in the background from the ranch mix. You get the bits of mushroom from the soup. If you are dead set against adding it, don't. Or change it out with another cream soup. It just does something and I love the bits of mushroom without having to deal with mushrooms. That made no sense. Oh well. Enjoy this comforting, soul warming soup friends! Oh this sounds heavenly! Will have to try it this week and I think I have all the ingredients. Well except for the shallots and green oinions. I hope you do try it! It is really great! Thanks for reading! OMG totally trying this... 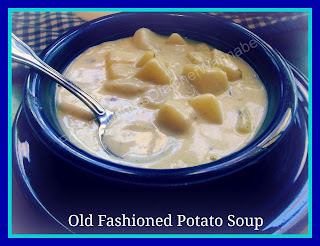 So tired of these "loaded" soups... just gimme taters! I am with you on that! Everything is "loaded". This is just old timey creamyish potato soup. Let me know if you try and how you like it! Thanks for reading!